This magnificent 5 bedroom + LOFT home is located on a premium lot providing ultimate privacy in Gateway and has over $233,000 in custom upgrades. With nearly 4,000 square feet of living space, this grand estate home offers plenty of room for the entire family. The interior boasts solid surface counter tops, 42” kitchen cabinets with crown molding, LG stainless steel appliances, 4 full bathrooms and Venetian pattern tile and real hardwood floors. Plantation shutters, crown molding and a 3-car garage with a stamped concrete driveway are additional upgrades in this former model home. The exterior space is just as exceptional and features a 2-story screened-in lanai with balcony, pool and spa and a massive outdoor kitchen with a beautiful trellis. With both gas and charcoal grills, ice maker, beverage refrigerator and even a kegerator, this outdoor kitchen is perfect for entertaining. Stoneybrook is conveniently located and offers LOW HOA FEES and an abundance of amenities including a clubhouse, fitness center, pool/spa, kiddie pool, playground, basketball courts, tennis courts, beach volleyball court, in-line hockey rink, baseball field, walking/jogging paths and much more.. Experience the luxury lifestyle in this stunning 4 bedroom + den pool home, located in the exclusive, high-end Renaissance golf community. The exterior boasts an ultra private, screened in custom infinity edge pool/spa and offers magnificent long lake views. The large outdoor kitchen is equipped with a grill, beverage refrigerator and ice maker. Inside, this well appointed home features KitchenAid appliances, granite countertops, crown molding throughout, custom wet bar with wine refrigerator, tray ceilings, plantation shutters and large bay windows overlooking the radiant pool. The home comes with a kitchen sink reverse osmosis system and a 3-car garage. The Club at Renaissance is an award winning, super low density golf and country club that offers an abundance of luxurious amenities and is ideally located with quick access to I-75 and just minutes from Southwest Florida International Airport and Gulf Coast Town Center. Call today to schedule your showing! This lakefront home is situated in the desirable family-oriented, gated Coral Lakes Community in Cape Coral. With 3 bedrooms, 2 ½ baths and an open concept living area that boasts a wood look tile, this home is a must see. In addition, the home features many upgrades including granite countertops, 42” cabinets, plantation shutters and a jack and jill bath with a double vanity. The AC unit is less than a year old. Coral Lakes is beautifully landscaped and conveniently located on the Del Prado Boulevard extension, east of Pine Island Road near many shops and restaurants. The amenities are plentiful and include a newly renovated clubhouse, fitness center, resort-style pool and spa featuring a kid wading pool, billiards, card room, beach volleyball, tennis and baseball/soccer fields. Call today to tour this exceptional home. This home exudes true Florida living from the moment you enter the gates of Pelican Landing in Bonita Springs, FL! Situated in the quaint Costa Del Sol neighborhood, this lovely 3 bedroom, 3 bathroom villa boasts a completely private courtyard pool and water fountain. The master bedroom/bath and one guest bedroom/bath reside in the main house, while the cabana featuring the 3rd bedroom/bath are ideally positioned poolside, perfect for guests. The home also boasts an attached 2-car garage, rear lanai with lake view and is being sold turnkey, furnished. Pelican Landing is one of Southwest Florida’s premier communities and offers fabulous amenities such as world-class golf, a private beach island, clubhouse, resort-style pool, tennis courts, fitness center, butterfly garden, sailing lessons, canoe and kayak rentals and more. This villa offers the feel of a single-family home with the ease of maintenance-free living along with a very socially, active lifestyle (golf and country club membership is optional). Call today! 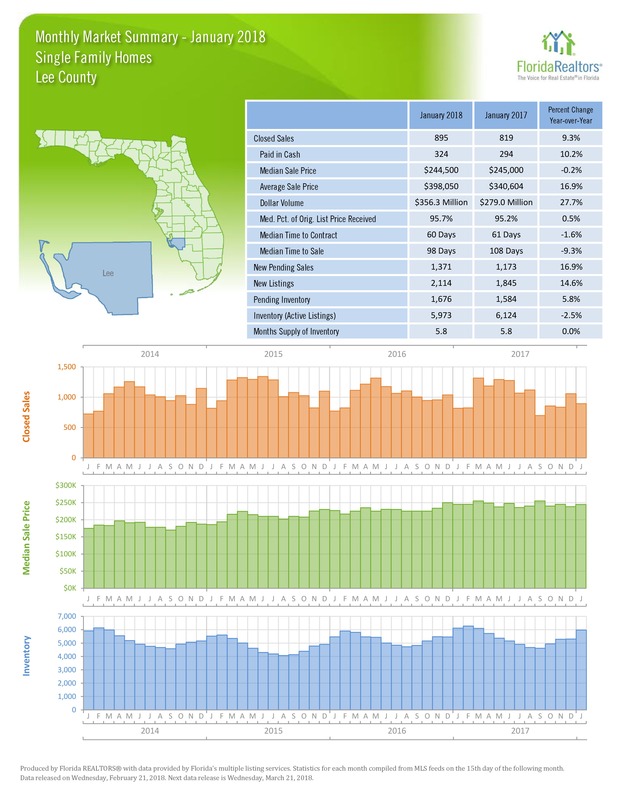 (Fort Myers, FL – April 23, 2018) – March was a huge month for the housing market in Lee County compared to the previous month. Closed sales, median sale price, and active listings were just a few of the statistics that saw a positive increase last month, compared to February 2018. Year-over-year was slightly down from 2017 at -2.7%. The number of closed sales for single family homes was up with 1,281 closed sales in March compared to 912 last month. Townhouses and condos were up from the previous month with 769 closed sales in March compared to 511 last month. New pending sales stayed relatively even for single family last month, while condos were up 8.2%. Median sale prices were up for single family homes (2.0%) and down for townhouses (-1.9%). And overall, houses spent less time on the market in March than they did at the same time last year. The median time to contract was 59 days – down from 67 days, or a change of -11.9%. The most popular price points continue to be the mid-range homes, specifically homes between $200,000 and $299,999, which all saw an increase in closed sales last month. First Quarter Housing Market Activity Sets the Stage for Strong Year Naples, Fla.
(April 13, 2018) – Sales of homes above $1 million in Naples during the first quarter of 2018 drove the market. 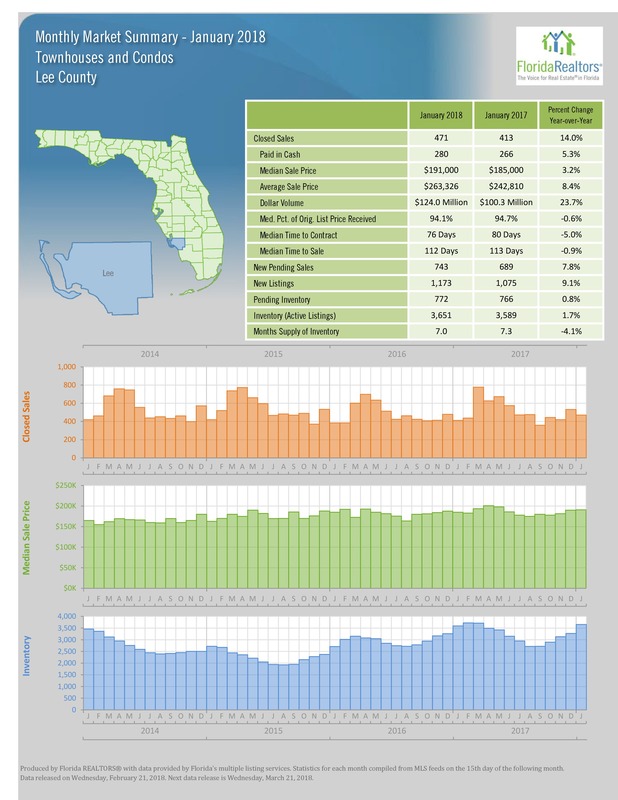 Their sales increased 61 percent compared to the same quarter of 2017 according to the First Quarter 2018 Market Report released by the Naples Area Board of REALTORS® (NABOR®), which tracks home listings and sales within Collier County (excluding Marco Island). Information valid as of April 19, 2018. Please contact us for the most current information and status of these properties. This stunning 5 bedroom + loft Next Gen single-family home is a must see in Reflection Isles. It comes complete with a Mother-In Law suite that features its own separate entrance, living room, kitchenette, bedroom, bathroom and laundry closet. With nearly 3,500 sq ft of living area, this former builder model boasts diagonal tile floors, stainless steel appliances, crown molding, granite counter tops, built in bar & desk and custom wood working detail throughout. In addition, the home features 2 AC units, an alarm system and a 3-car garage with epoxy floors. The home also showcases a screened-in lanai and a beautiful heated pool & spa with magnificent water views. Situated in the highly sought after Daniels corridor, this community boasts LOW HOA FEES, gated access, community pool and spa, tennis courts, playground and more. This desirable location is just minutes from Southwest Florida International Airport, I-75, Boston Red Sox and Minnesota Twins Spring Training Stadiums, Gulf Coast Town Center and Bell Tower Shops. Call today! Calming luxury from the moment you enter this beautifully remodeled 5 bedroom home. With welcoming French doors, soaring 20′ ceilings and an abundance of natural light, this home is a must see. The expanded, over-sized kitchen has been completely remodeled with designer touches including 42” maple cabinets with crown molding, under and over cabinet lighting, travertine backsplash, LG stainless steel appliances with double oven and Quartzite counter tops. The home boasts 3 full bathrooms, 3 car garage, a first floor bedroom and full bath and dual vanities in the master bath along with marble counter tops and a frameless glass shower enclosure. 79″ Sony 4k Ultra HD Smart 3D TV also included!!! Located in the gated community of Laguna Lakes, the community offers residents many amenities including a clubhouse, fitness center, fishing pier, swimming pool with spa, tennis, volleyball and a children’s play area. Convenient Fort Myers location close to world famous beaches, schools, Barbara B Mann Performing Arts Center, Wa-Ke Hatchee Recreation Center, HealthPark Medical Center and Golisano Children’s Hospital. Call today to tour this stunning abode. Beautiful 3 bedroom, 2 bathroom First Floor carriage home situated along the Championship Golf Course in Hunter’s Ridge Golf & Country Club. Surrounded by lush, tropical landscaping this home offers breathtaking fairway and woodland views from the private screened-in lanai. Inside, this pristine home boasts stainless steel appliances and granite countertops in the kitchen, lovely wood flooring in the bedrooms and upgraded lighting fixtures and crown molding throughout. Hunter’s Ridge is a wonderful, gated community just minutes from the Gulf of Mexico. With resort-style amenities such as the luxurious and completely RENOVATED 10,000 square foot clubhouse, lighted tennis courts, year round social events, state-of-the-art fitness center, swimming pool with lap lanes, golf and much more, you will feel as if you are on vacation each and every day. Hunter’s Ridge social membership is included with this sale. Call today to tour this ultimate Southwest Florida lifestyle. (Fort Myers, FL – February 14, 2018) – In a year that saw the housing market disrupted by a major hurricane, Lee County statistics for 2017 were mixed. For the most part, however, nothing was drastically different than what we saw in 2016. North Fort Myers had the biggest drop in the number of Closed Sales in 2017 – down 13.8%. Cape Coral and Sanibel/Captiva were the only places that saw more Closed Sales than in 2016. The number of active listings in 2017 only saw slight changes as well. There were 5,305 Single Family listings, compared to 5,463 in 2016 (a change of -2.9%). There were 3,271 active Condo listings, up 0.4% from 3,259 in 2016. The biggest change in all of the statistics was Median Time to Contract for Single Family Homes. In 2017, it was 66 days, and in 2016 it was 56 days – a jump of nearly 18% year-over-year. There were major drops in the number of Single Family Homes sold in the 3 lowest price ranges – Under $50,000, $50,00-$99,999, and $100,000-$149,999. The biggest increases were in the $200,000-$249,999 range, and the $400,000-$599,999 range. Across the entire state, the housing market finished 2017 with more sales, higher median sale prices, and a drop in the number of distressed property sales compared to 2016. Information valid as of February 19, 2018. Please contact us for the most current information and status of these properties. Prime North Naples Location! Situated in the Palm River area and minutes from white sandy beaches, this Old Florida style 2 bedroom condo offers a lot! Spectacular sunsets and long fairway views can be enjoyed from the private, 2nd floor screened-in balcony and this charming condo also features an attached 1-car garage. LaPlaya Golf Course is conveniently nestled within Palm River and is one of Naples’ finest 18 hole golf courses. In addition, the community boasts a pool, pool bar and is within close proximity to shopping, dining and entertainment at Mercato. This charming condo offers the ease of maintenance-free living. Call today to tour this fabulous Floridian retreat. Buy now and pay later. (sort of) This villa is currently being rented through June and tenant would be interested in renewing if buyer wished. Buy now and receive income until you are ready to move in. This recently updated Capri model villa is situated in the stunning, resort-style lakefront community of Village Walk. Fresh paint, a new back splash, new stainless appliances in the kitchen, and new lighting fixtures are a just few of the updates that give this unit a fresh new look. This home also offers a screened-in lanai with a stunning lake view, a monitored alarm system, 2 car garage, vaulted ceilings and is within walking distance to the clubhouse. Village Walk of Bonita Springs boasts an unparalleled town center that features a resort pool, lap pool, basketball court, full-time activity director, three bocce courts, fitness center, playground, eight tennis courts, gas station meeting rooms, library, restaurant, bank, hair salon, post office and more. This prime location is just minutes from shopping, dining and sandy white beaches. Call today to schedule your tour!